Douglas Klauba grew up in Chicago, where he collected illustrations from magazines and paperback covers, printed his own comic books and made movies with friends. His creative impulses lead him to a serious interest in painting, and he went on to study and graduate from the American Academy of Art in Chicago. 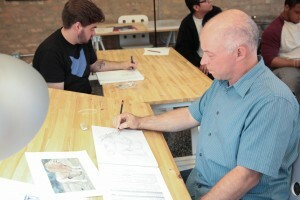 After gaining valuable professional experience at several Chicago illustration studios, Doug moved to California to study with illustrators Drew Struzan, Kazuhiko Sano, Charles Pyle, and Thomas Blackshear at the Academy of Art College in San Francisco. Upon returning to Chicago, Doug established his own studio where his illustrations have been commissioned for many book covers, magazines, calendars, posters and collectibles for a variety of national and international clients. A few of this notable clients include Century Guild, DC/Upperdeck, Moonstone Books, Kino Lorber, Scottish Tourism Board, The Adler Planetarium, Rogers and Hammerstein Foundation, Harper Collins, Dynamite Entertainment, Pegasus Books, and Edgar Rice Burroughs Inc. Doug was commissioned by The Bradford Exchange for a variety of collectible projects including a plate series of Gone with the Wind. His success in the collectibles market has lead to collaborating with his mentor on a plate series, Thomas Blackshear’s Ebony Visions for Willitts Designs. Douglas Klauba is an award-winning painter and illustrator whose work is recognized for his heroic-deco style with influences of art nouveau design and dramatic use of lighting. Doug’s paintings have been exhibited at the Society of Illustrators in New York and Los Angeles and his artwork has been included in the juried art annuals of Spectrum: The Best in Contemporary Fantastic Art and Imagine FX magazine, as well as, having work included in the recent publications: The Art of Horror – An Illustrated History, and, The Art of Horror Movies. A poster of Doug’s painting, Stella 7, can be seen on the popular television show Big Bang Theory.